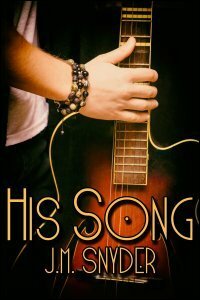 Dane is destined for greatness, his boyfriend Krish just knows it, but first he needs to break into the local music scene. Randy Blake is Dane’s idol, a small-town musician with a sound Dane likes. When Blake asks Dane to stop by sometime, maybe have a private jam session, Dane is ecstatic. But it seems Blake has something other than music on his mind. Krish struggles with jealousy — he knows Blake would help advance Dane’s music, but Krish just can’t trust the man. A more pressing question, though, is can he trust Dane when his lover seems blinded by his idol? Outside it's crisp and chilly, a sharp contrast to the warm stuffiness back in the coffeehouse. Dane leads the way to Krish's pickup, walking slow to keep within the span of Krish's arm. With every other step, his hip bumps Krish's, and Krish thinks again of the couch in their living room and laying down on his stomach with Dane behind him, easing into him, crying out in the cushions when he comes. Since there aren't many people outside, he pulls Dane back against him and kisses his lover's temple. Dane holds up a small business card, as if Krish can read it in the dark, and says, "He told me to give him a call, can you believe it? Says he wants to hear my sound." There's that jealousy again, searing down the center of his chest like heartburn. With a forced laugh, Krish tells him, "That girl at the counter wanted you to call her, too." Dane frowns at him, confused. "Why?" he asks. They reach Krish's truck. Pulling his keys from his pocket, Krish unlocks the passenger side door, holds it open for his lover. "Same reason, I suspect," he grumbles. He hadn't thought his opinion of Randy Blake could possibly get any lower than it already was, but he was wrong. But Dane's still frowning. "She wants to hear me play?" he asks. Krish sighs. "She wanted to hook up with you!" he cries, exasperated. Sometimes he wonders if Dane's really as clueless as he seems -- he can't get it through his head that he's a cute boy, great hair, pretty face, nice body if you like them on the thin side, which Krish does. "Jesus, Dane," Krish mutters. "Just get in already, will you?" When Dane doesn't move, he runs a hand across his face and tells himself it's not Dane's fault, he's not angry at him. "I just want to go home, okay? Please?" Grudgingly, Dane climbs into the passenger seat. "He's a musician, Krish --" he starts, and then Krish slams the door shut on the rest of the sentence. Doesn't mean he's not human, he thinks, walking around the back of the truck to the driver's side. Doesn't mean he doesn't want to get with you. He's a musician, Dane, not a priest. As he climbs behind the wheel, Dane tells him, "It's not like that, babe. I said I played a little and he wanted to hear some of my songs, that's it. He said we can get together for a jam session, his words." Starting the engine, Krish pops the truck into reverse and steps on the gas. "Fine," he says. He hates that he thinks it's something more. It's not that he doesn't trust Dane -- it's everyone else he has his doubts about. But Dane isn't one to let things like this go. "It's not what you're thinking," he says, snapping his seat belt into place. Then he rubs Krish's thigh, a soft touch through the heavy denim jeans he wears. "He just wants to hear me play, that's all." Krish doesn't respond. You don't play for anyone but me, he thinks, but he's not going to say that. He knows Dane wants to play onstage one day, he knows the boy's terrified of crowds but it's his dream and he has to start somewhere, doesn't he? Not with Randy Blake. Anyone else but him. It wouldn't bother him so much if Dane's eyes didn't gloss over every time he mentioned the musician. He's not even sure if Dane is aware he does that. Giving Krish's knee a playful squeeze, Dane says again, "It's not like that --"
"Fine," Krish tells him. He doesn't want to talk about it anymore, but he's angry now, that's evident when he peals out of the parking lot, tires squealing down the road. Dane sighs. "He's old enough to be my father," he starts. Krish forces a thin laugh. "That never stopped anybody," he mutters. "It stops me." Dane looks at him but Krish can't meet his gaze, he stares out the windshield at the empty streets and wishes they had stayed home tonight. In front of the TV, cuddling together on the couch -- no talk of Blake, no sudden phone number in his lover's back pocket. Ahead of them, a street light flickers from green to yellow, and Krish considers stepping on the gas, shooting through the intersection, just to put as much distance between them and the Dharma and Randy Blake as he possibly can. But before they reach the light it turns red, and Krish eases the truck to a stop. "Krish," Dane says softly. Krish looks at the hand on his knee, then folds his fingers into Dane's palm. Dane's pale fingers close around his, strong and gentle, and in the darkness, Krish's dark skin is the same gray shade as Dane's. "Look at me?" Dane asks. It's almost a plea. How can Krish hope to resist? When he looks up, he sees those dark eyes looking back, framed by a fall of hair. Dane touches his face, smoothes his fingers into Krish's hair, leans closer and presses his mouth to Krish's, his lips warm and damp, his tongue eager as it licks into him. He gives into the kiss, feels his body relax, leans into his lover and lets him make things right again with his mouth, his tongue, his hand on the back of his neck. "I love you," Dane whispers, his breath hot against Krish's chin. "I'm sorry," Krish begins. Now he feels horrible, it's just a damn number, not a date, not a freaking marriage proposal. "Dane --"
Dane kisses his apology away. "Shh," he sighs. "The love and commitment between Krish and Dane is beautiful to watch. They are completely different from each other, but the difference is what keeps their love fresh and new." "A lovely tale about a well-established couple who weather a storm of jealousy, lust and despair. Its well-written, lyrical prose hits just the right note."